The liver performs over 500 vital body functions. In addition to its critical role as a detoxifier and filter, it is also essential in digestion, energy production, and blood production. A modern diet of processed foods, exposure to environmental pollutants, excessive alcohol and medication intake, excess body weight and liver disease are all significant threats to liver health. There are a number of health strategies that can help protect, maintain and improve liver function. Take Futurebiotics Detox and a comprehensive multi-vitamin and eat a diet that emphasizes fruits and vegetables, whole grains, nuts & seeds, fish and lean meats. Include healthy fats, which contain essential fatty acids. Minimize or avoid fatty foods, dairy products, sugar, alcohol and processed foods that make the liver work harder. A healthy weight can help prevent fatty liver. Excess body weight is the primary predictor of fatty liver (hepatic steatosis) caused by the accumulation of triglyceride droplets within individual liver cells. Get at least 30 minutes of aerobic exercise every day to help maintain an ideal body weight. Remember to stay well hydrated while exercising. Short-term fasting can help the body naturally detoxify and reduce liver stress. Drink plenty of clean, pure water to help flush toxins from the body. To reduce the load and stress on your liver, avoid contact with environmental toxins, including cigarette smoke, whenever possible. In consultation with your health professional and whenever possible, limit your use of over-the-counter medications. Healthy liver function aids digestion and elimination, reduces bad breath and body odor, increases energy, improves skin conditions like acne and eczema and can even reduce the symptoms of PMS. Detox - taking inspiration from Nature. This 100% vegetarian product has an aromatic botanical essence added, along with natural whole plant co-factors from Turmeric root. 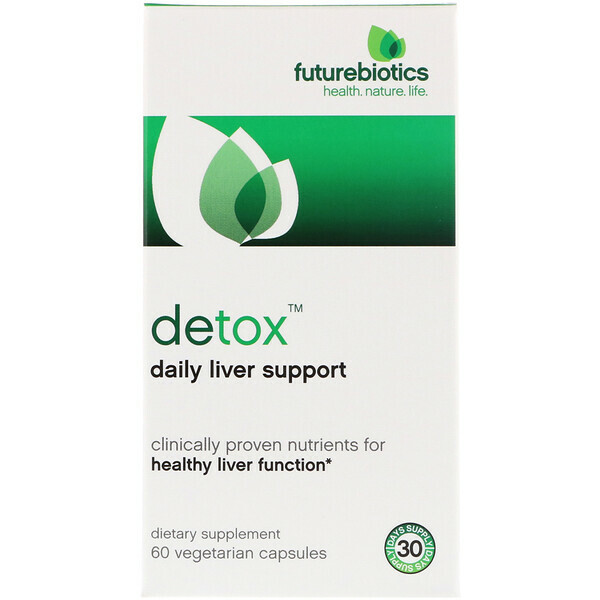 Clinical research has shown that the ingredients in Futurebiotics Detox, including Milk Thistle extract, Picrorhiza kurroa extract, Artichoke leaf and Turmeric extract all help support healthy liver function by protecting the liver, simulating and regenerating liver cells and providing antioxidant support. Milk Thistle extract, standardized for 80% silymarin, has been used for centuries for both digestion and liver concerns. Silymarin is a group of lignan flavonoids unique to Milk Thistle (Silybum marianum). Silymarin is a powerful antioxidant that research has shown protects the liver from free radicals, helps normal liver function including repair and regeneration of liver cells and is a hepatoprotectant that can protect the liver from the damaging effects of toxins. An Ayurvedic botanical, Picrorhiza is standardized to contain 4% kutkins. It has been studied for its ability to stimulate normal liver function, including the growth of damaged liver cells, protecting healthy cells from damage, and acting as an anti-inflammatory and antioxidant. 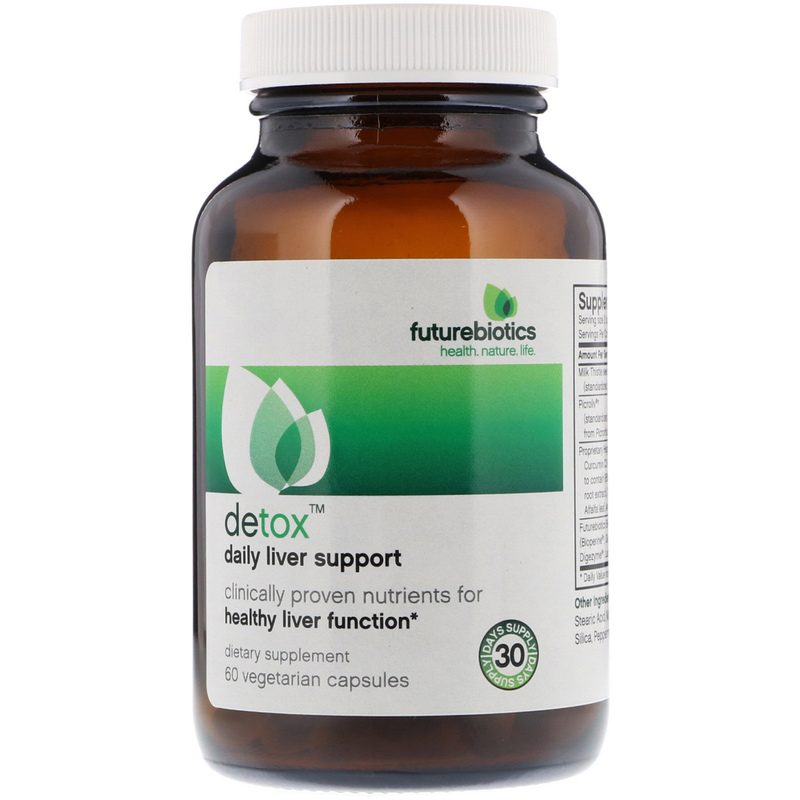 Futurebiotics Detox includes a proprietary hepatoprotective compound which contains complementary botanicals and whole-plant natural co-factors, including Artichoke leaf, Turmeric extract, Dandelion root and Alfalfa leaf, all of which have historically been used to support healthy liver function. Futurebiotics Detox is potency-enhanced with Futurebiotics BioAccelerators. Clinically-proven Bioperine (Piper nigrum extract) improves nutrient bioavailability, while our proprietary natural compound of Ginger extract, Trikatu, super-potent Digezyme and Lactospore boosts digestion and absorption. 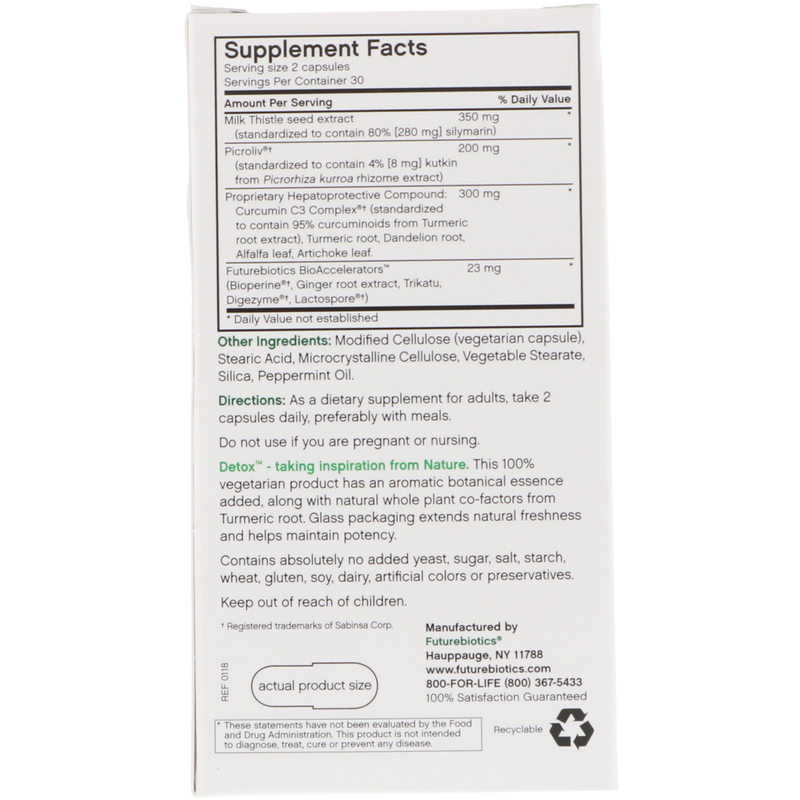 Silybin is the principle flavanone in silymarin, the active constituent group standardized in Milk Thistle. Silybin has been shown to assist protein synthesis and cell-regeneration in the liver. As a dietary supplement for adults, take 2 capsules daily, preferably with meals. Modified cellulose (vegetarian capsule), microcrystalline cellulose, stearic acid, vegetable stearate, silica, peppermint oil.